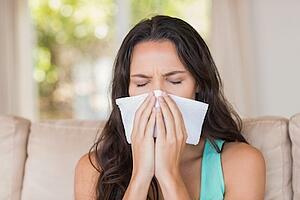 Do you think your Springs luxury apartment home is a safe haven from allergy triggers? Surveys show that more than 50 percent of homes have at least six allergens present in the air. While you can't change Mother Nature, these tips can help you control the allergen levels in your home. Dust mites are by far the most prevalent indoor allergy triggers, but simply dusting usually just stirs them up. Carpet and upholstery fibers are big dust traps, but vacuuming can also stir up dust mites. Use a vacuum equipped with a HEPA filter that holds smaller particles. Many commercial cleaning products contain harsh chemicals that can aggravate sensitive sinuses. Look for eco-friendly cleaners made from natural and plant-based ingredients, or save money with DIY cleaning products made with items you probably already have on hand. At night your respiratory system is at the mercy of dust mites trapped in blankets, sheets and pillows. Wash linens at least once a week in water heated to at least 130 degrees and dry them on high heat to kill dust mites. If you're particularly sensitive, use allergen-proof covers for the mattress and bedding. You love your precious pets, but their hair and dander can be tough on allergies. In addition to vacuuming frequently, bathe your pets and keep them brushed and groomed. Consider restricting them to one room to lessen the spread of allergens. Damp bathrooms are a breeding ground for mold and mildew, which are serious allergens. Reduce moisture by running the exhaust fan after a bath or shower and replace shower curtains if they start getting mildewy. Letting in fresh air feels lovely, but you're also letting in pollen and other outdoor allergens. Close your windows if you're chronically stuffed up during peak allergy seasons in your area. If you spend a lot of time outdoors, shower and change your clothes as soon as you get back home to keep from spreading allergens you may have picked up. If you have a great allergy tip to share, let us know in the comments!